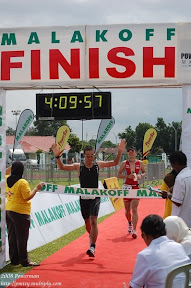 The race was held in Kuala Belait district, 26th December 2010. The race was supposed to be swimming, cycling and running but if the sea condition on that day was not good, the swimming will be change to a run along the beach. Race day, the weather was good, the condition was good, low tide is taking place and we were expecting for the swim to take place but instead it was a run to the sea until chest high and return back to the sea. I guess they didn’t request for help from authorities of the seas such as Marine police, fire brigade, sports departments or who ever can provide assistant in the water. My mountain bike – tires converted to 1.5 touring tires and bottle cage at the back. My pink Nike shoes, swim cap and goggle. Body marking done around 7:00am and those white barriers were used as a parking for MTB. Luckily it was a mountain bike, if it was a road bike or triathlon bike, many would have complaint about the racking styles and wouldn’t used it. It would certainly damaged your carbon fork. It wasn’t a swim, it was a run to the sea chest high, U-turn at the pole and run back to the beach. It was a very fast run and completed within 2 minutes. So, it’s going to be a cyclist race and it’s going to be an advantage to few peoples. 8:17am, I’m on my way to the 30km bike ride. Hj Tukuk have just arrived for his first transition. I was 11th out of the water and at the starting of the bike leg, if my calculation is correct, I’m 5th. After 800m, Faizal and Luqman comes along and I tried to draft behind them but they were too fast for me. Then after that Syazwi come along and he was also too fast for me. Those 3 are in the Brunei cycling training program. Damn fast !!!! At around 10km mark, Hj Tukuk comes along and I managed to draft behind him. With that we managed to overtake another 3 more cyclists and they also draft behind us and stayed together as long as everyone can hold. Hj Tukuk managed to break away from us and 1 cyclist followed him. The 3 of us just let him go, I, myself don’t want to chase him. It was a good attack from him. He stayed drafting way at the back, recovering and at the right moment when some of us are already tired, launched the attack. The three of us arrived almost the same time around 9:16am. The 3km run was a very fast run. At the start of the run, I was 9th and tried very hard to catch the person in front of me which was Hj Tukuk. Around 1km to the finish line, I got a cramped around my thigh, but I just keep on going but carefully not to make the cramped worsen which would force me to slow down or walk. All of us, the top 10 winners got our prizes. Actually only the first 3 were awarded the prizes but somehow on that day, they increase the number of prize winners. Congratulation to all, it was a good event…………..